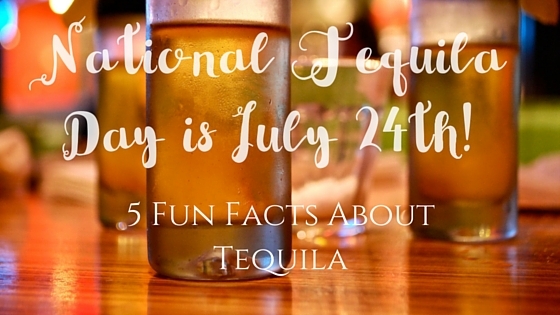 Sunday, July 24, 2016, is National Tequila Day! That’s right, there’s a national holiday created with the intention of inspiring appreciation for the art and cultural influence of that famous South-of-the-Border liquor! 1. Agave honey water is the source of tequila. While it is also used to make sweeteners and syrups, this liquid in the center of the agave (aquamiel) is fermented and aged to produce liquid gold for millions of people. 2. Tequila, like beer, wine, and whiskey, comes in a variety of forms and flavors. There are many kinds of tequilas, each with specific differences that connoisseurs can easily detect. What you likely drank when you were younger was Silver/Blanco/Plato Tequila, which is a clear tequila that has not been aged. Reposado tequilas, such as Milagro Select Barrel Reposado, on the other hand, have been rested for somewhere between two and twelve months and have a light amber-gold color and more mellow flavor. Añejo, or aged, tequilas, such as Centenario Añejo, have matured for at least a full year in oak barrels, producing a deeper gold color than reposado tequilas and a more complex and subtle flavor. 3. Mezcal is the one with the worm. In popular culture in the United States, drinking tequila is often associated with “the worm” at the bottom of a bottle. However, most tequilas, which are made from the blue agave plant, do not include a worm in the finished bottles. Only Mezcal, which is a liquor made from any of the other 250+ forms of the agave plant, traditionally includes a worm. Mezcals like Wahaka Joven Madre Cuishe and El Zacatecano Añejo are smooth, robust, and coveted. Some companies do add the caterpillar of the maguey worm to their finished bottles, producing mild chemical changes that some consumers may find highly desirable. 4. Most tequilas are made from Agave plants, except for Sotol tequilas. Sotol tequilas are made from a different Mexican plant, the Dessert Spoon, which grows in the desert. Sotol tequilas generally come from the Chihuahua Region, with well-regarded brands including the Blanco, Reposado, and Añejo versions of the Hacienda de Chihuahua liquor. 5. Tequila is named after a city. Most tequilas come from the Jalisco region of Mexico, and more specifically, from the area around the city of Tequila. In fact, Mexican law mandates that most tequilas, with certain exceptions, be manufactured in Jalisco. Don’t miss this year’s celebration! Visit Agave Cocina and Tequilas in Seattle or Issaquah to enjoy this remarkable potion in style and with good company.